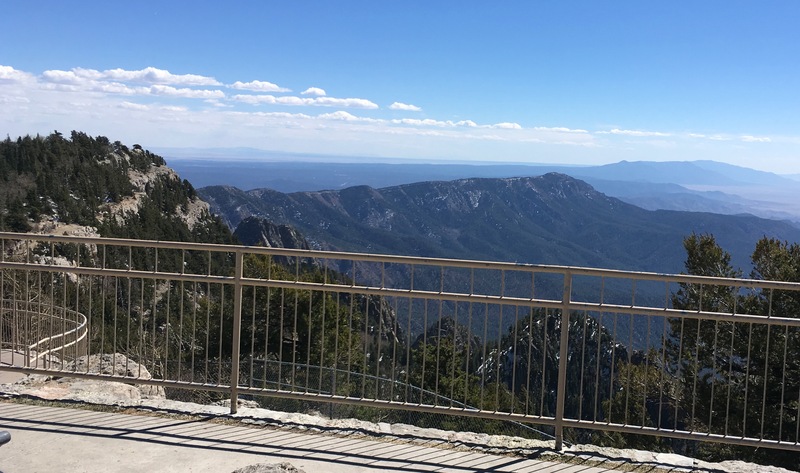 This hike will take you from the yucca-and-mesquite of the Tularosa basin up into the forested heights of the Sacramento Mountains. Along the way you follow a canyon that, even in a drought bedeviled decade, possesses running water. Music in the canyons! As is typical of desert streams, the water often flows beneath the ground. 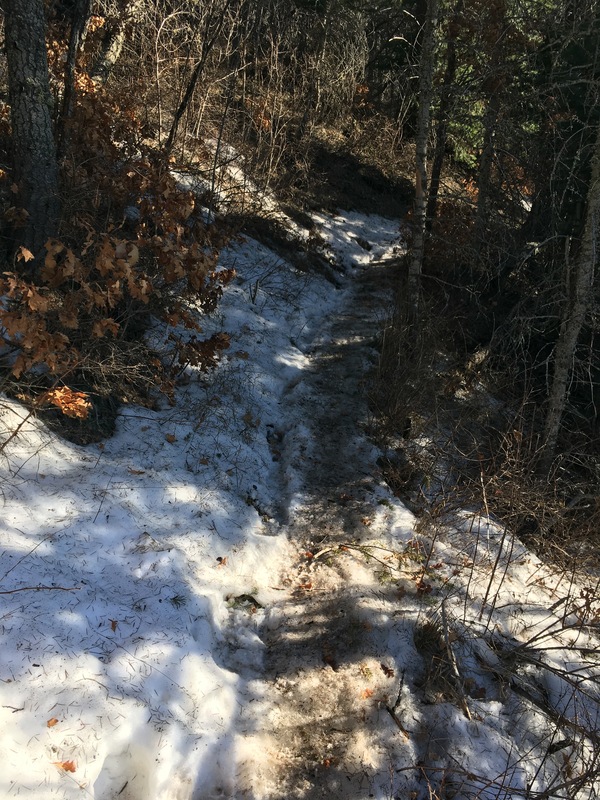 Even when it’s above ground the water is usually far below the trail. Pack your own! 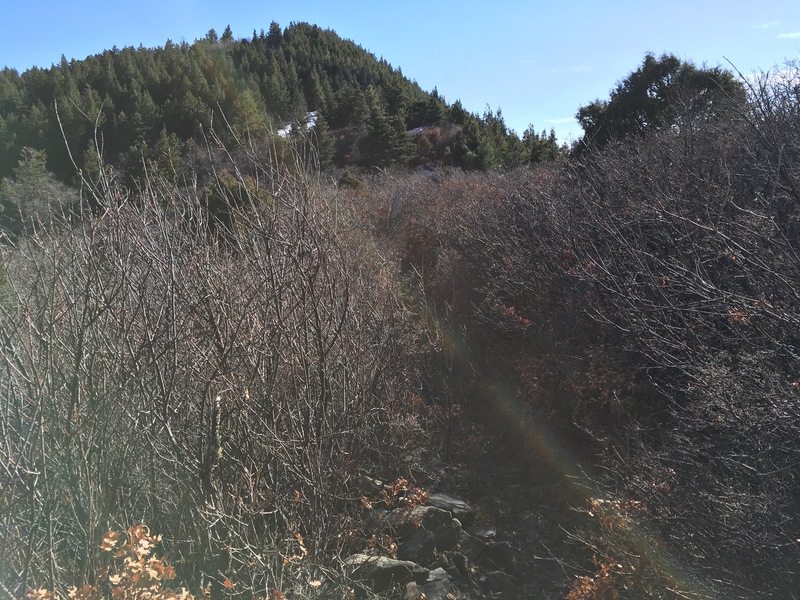 Caveat: I intended to hike to a place called Sunspot near the summit of Sacramento Peak. The writeup here will necessarily be incomplete since my turn-around time arrived before my destination did. After 62.5 miles, turn right (heading south) on US Route 54. The Shell station on the left will be the last chance to fuel up until you return. After 9.1 miles, make a left-hand turn (across oncoming lanes) to Dog Canyon Road. After 4 miles, enter the Oliver Lee Memorial State Park. The trail leaves from the visitors center. 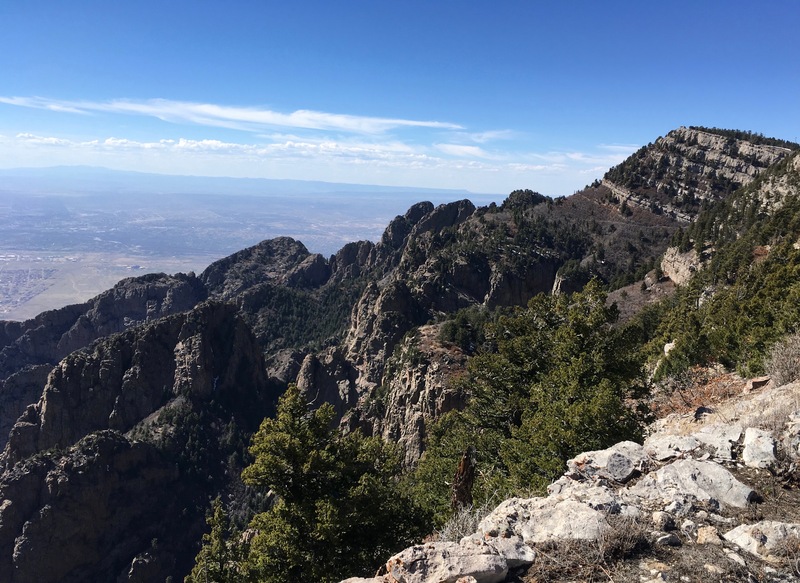 The trailhead begins at 4400 feet, ascends via steep switchbacks to a shelf on the south wall at 4900 feet, then contours gently upward as it follows the canyon east. 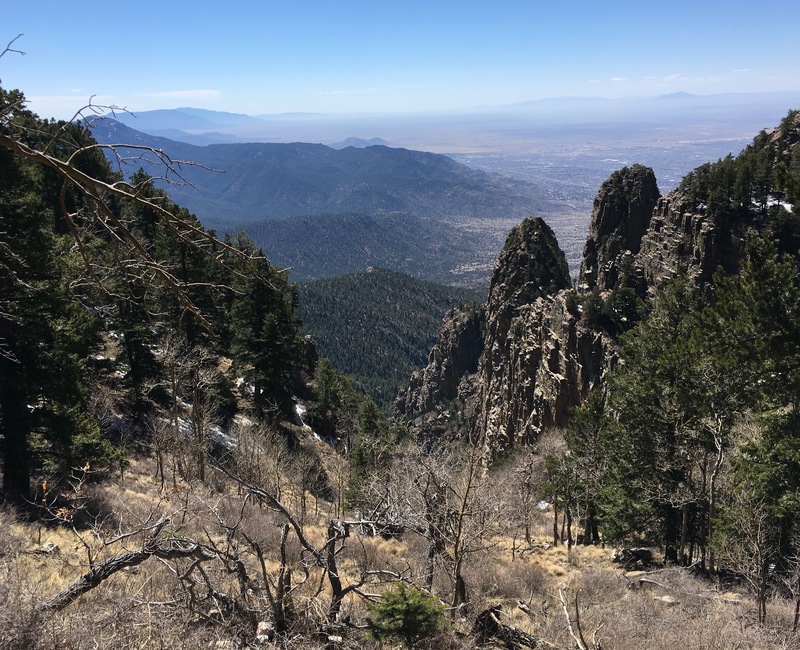 Reaching a broad and grassy shelf at 5900 feet, it then drops back down to the canyon bottom, traverses it to the north side, climbs rapidly to a feature called the “Eyebrow” that rises to about 6700 feet. Entering the bottom of a large bowl the trail switchbacks inside the bowl to about 7300 feet, where it eases east out onto a pretty series of shelves before turning north again to gain the true rim of the canyon. There it ends (after 5.1 miles) at an intersection with a road signed 90B. The road can be followed east as it stays along the rim, then after about 2.5 miles gently descends to reach West Side Road (signed “90”). Crossing 90, encounter the trailhead for Road Canyon. 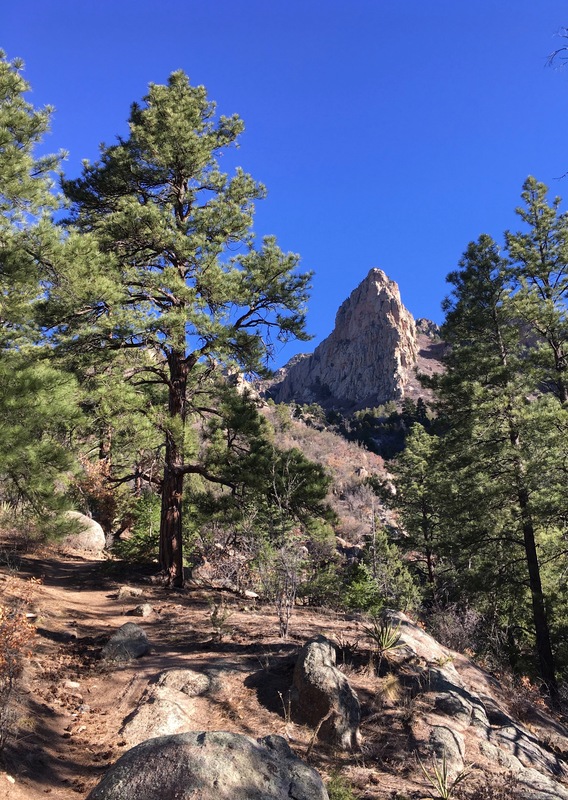 I only got about half a mile up this trail, but I believe it will take you to a prominent man-made spire at a place called Sun Spot at 9240 feet. Total altitude gain: 4840 (estimated). Total milage: 9.0 miles (estimated, one way). Another new and regrettable feature has to to with paying your park fees. 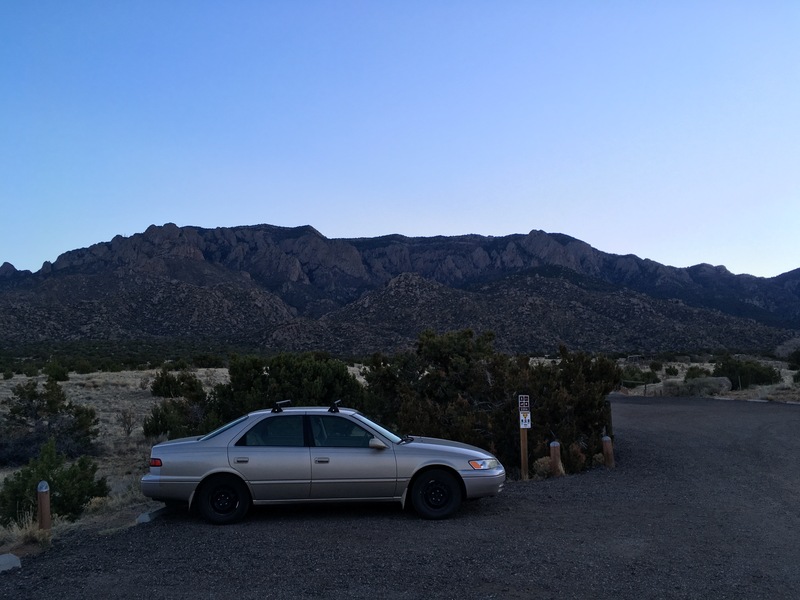 I got to the park at 7:40 am (having left Las Cruces at about 6:00). It was surprising to find that the Self Service Pay Station was closed. I wound up napping in the car until about 8:15 when an attendant arrived to open the station. He proved to be a great guy, explaining that people were finding ways to steal payments out of the steel payment box. As a consequence the Parks division can’t allow payments to stay overnight in unattended boxes. I hope that the EMNR Department finds a way to address this problem. Until they do it means a late start unless you camp at the park. Next time my plan will be to arrive a day early, get a permit for a primitive site and carry a backpack up into the canyon. Near the entrance to the memorial there is a turn-out with water (both potable and non-potable) and trash service. It is advertised for use by RVs but the services are available to all. I think there were several outhouses scattered about as well. If you want to use your own RV then note that developed sites with sewage and electrical hookups are available. However, a sign at the pay station cautioned that all the developed campsites were taken. Apparently they are very popular – call ahead. This is a full service trailhead! There used to be a store called Oliver Lee Country Store on Dog Canyon Road. It appeared to be out of business when I drove past. 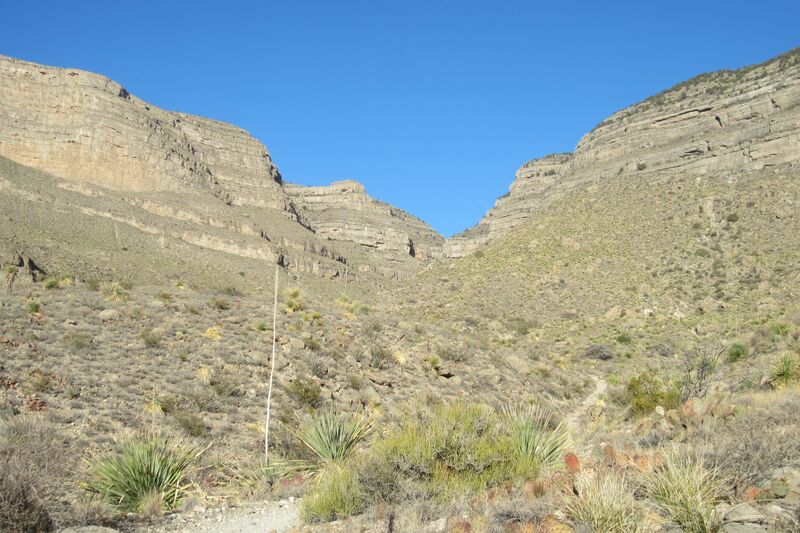 View from lowest shelf to the north wall of Dog Canyon and a cave opening. 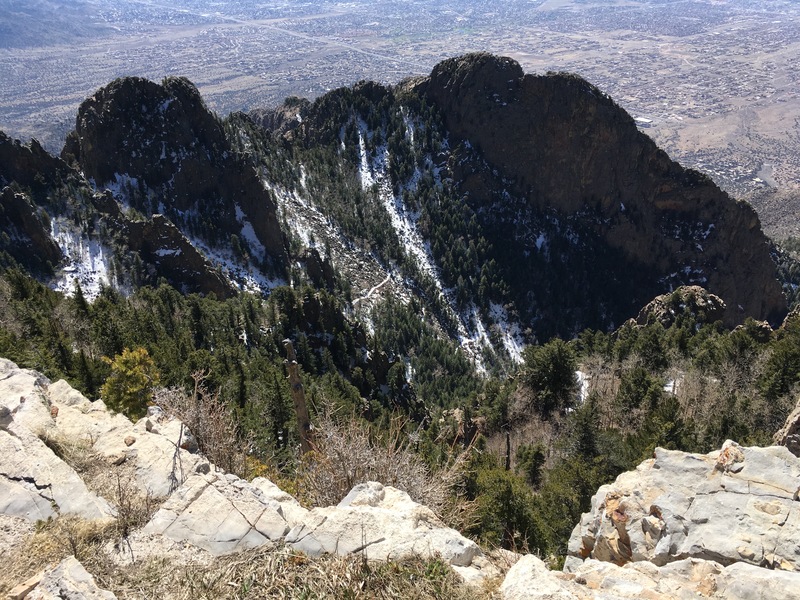 According to Wikipedia, the sheer escarpment that marks the eastern edge of the Tularosa Basin arose when a huge block of limestone sheered away from its neighbors and the western end of that block was thrust several thousand feet upwards. 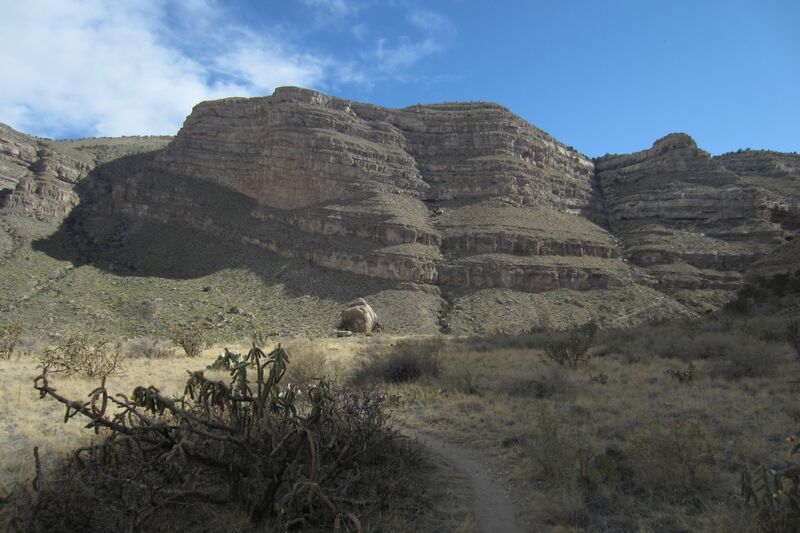 Dog Canyon is an example of what can happen to a steep limestone face given a source of water and a few million years. 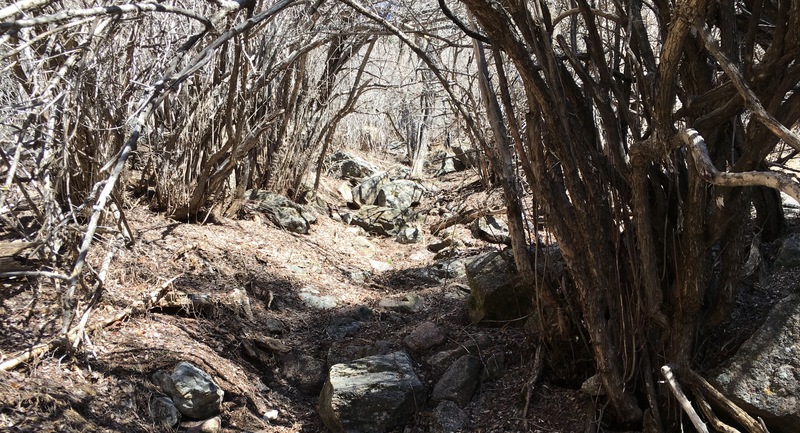 Your first job, then, is to follow the trail as it briskly ascends this escarpment. 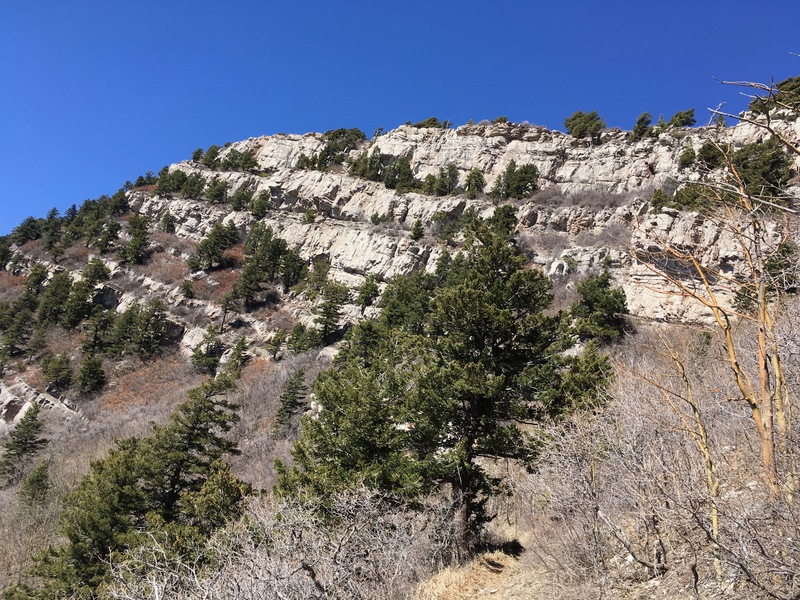 The trail rises until it hits the first of a series of shelves, follows the shelf as it enters the canyon and narrows to a mere overlook, but an overlook with a great view of a huge cave across the canyon. Ruins of a stone cabin. There was surface water running just 30 feet away from the ruin. Rounding a rib, the trail crosses the bottoms of two bowl-like structures. At the upper end of the second bowl the trail begins to switchback and rises to a broad shelf. This second shelf has an abundance of grass (you are no longer in the Tularosa basin! 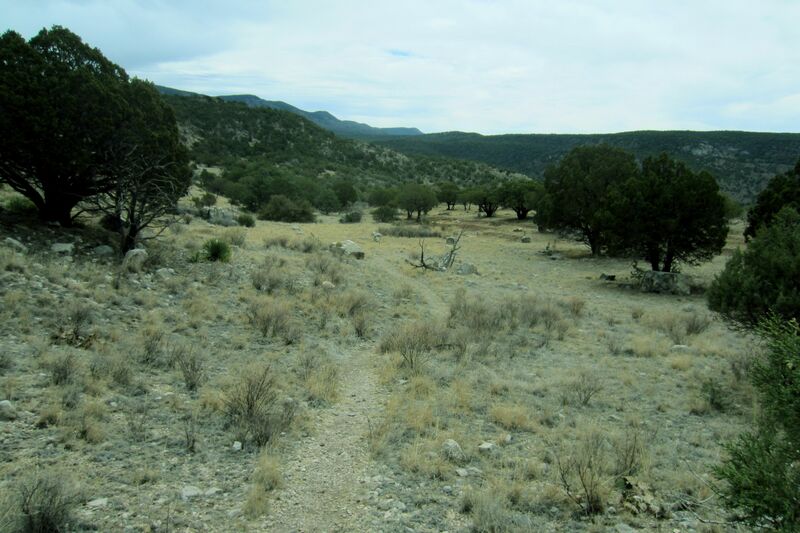 ), an enormous number of flowering cacti and several “hardened” spots for camping. 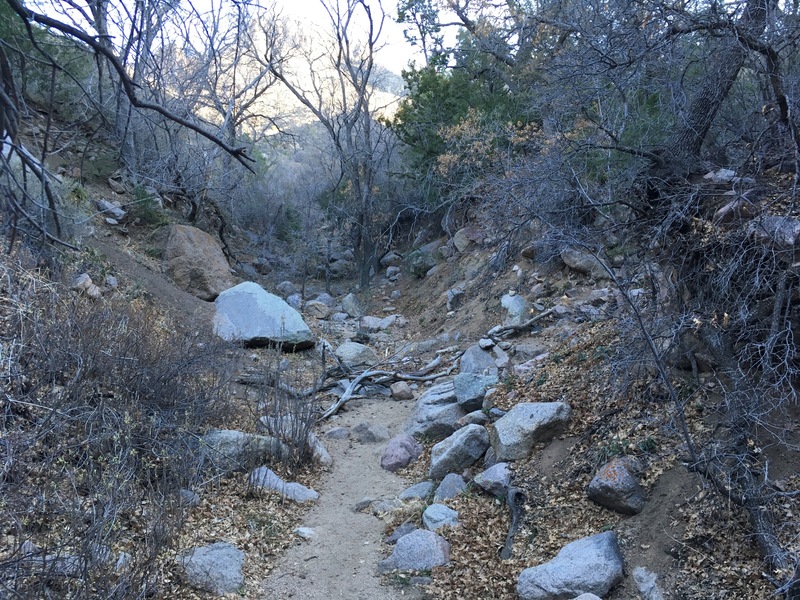 At the upper end of the shelf, a little over 2.5 miles from the trailhead, the track begins to drop down towards the canyon bed. Looking down you can see a stone ruin where someone had built a one-room building against a large boulder. There was water flowing in the canyon at this point, which helps to explain the presence of grasses and tall trees (junipers, if I recall correctly). This spot is about 2.8 miles from the trailhead and makes a sensible place for turning around if you’ve had enough hiking for one day. 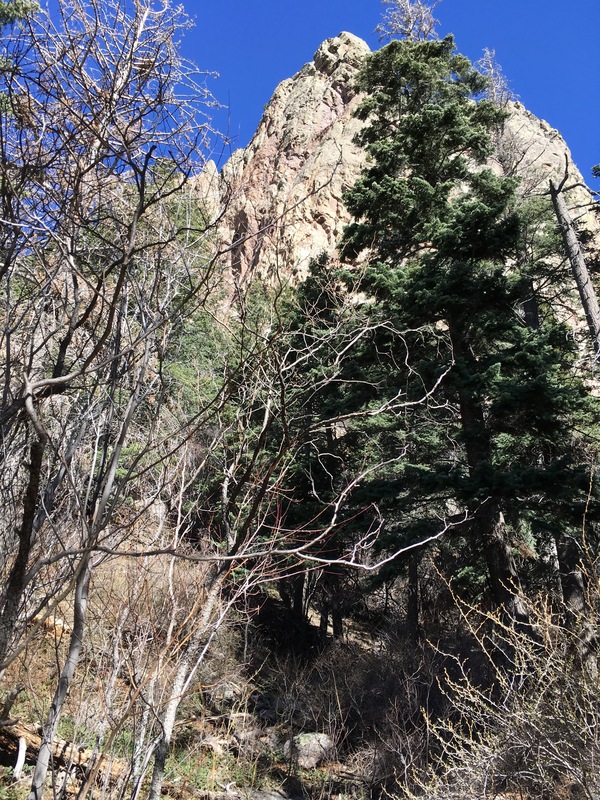 View to north canyon wall. The low point on the rim (extreme left hand side) is the opening to the upper bowl. To the right of this opening is a cliff face. From the top the cliff drops almost vertically until it hits the first sloping debris field. 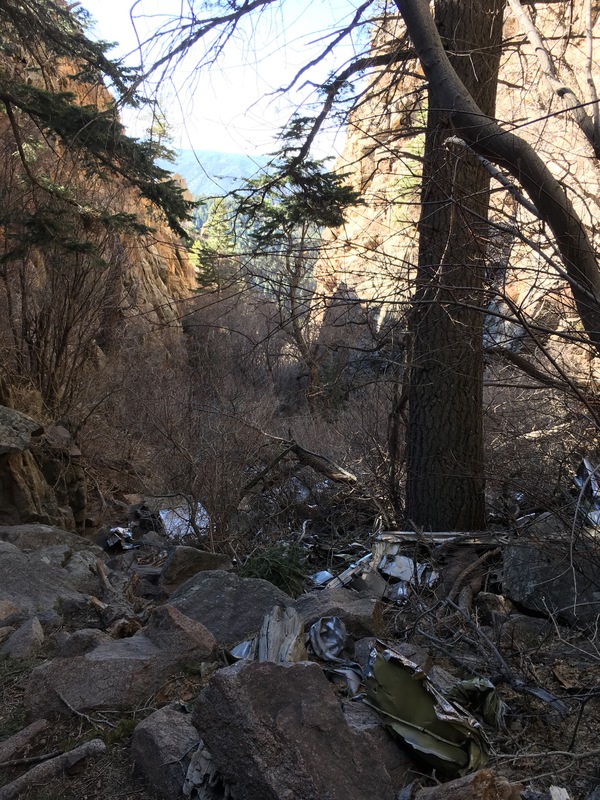 Below the first debris field is a small cliff and a smaller debris field. Below that is the bottom-most cliff and the canyon-bottom debris field . If you’re up for more then you’re about to get more. 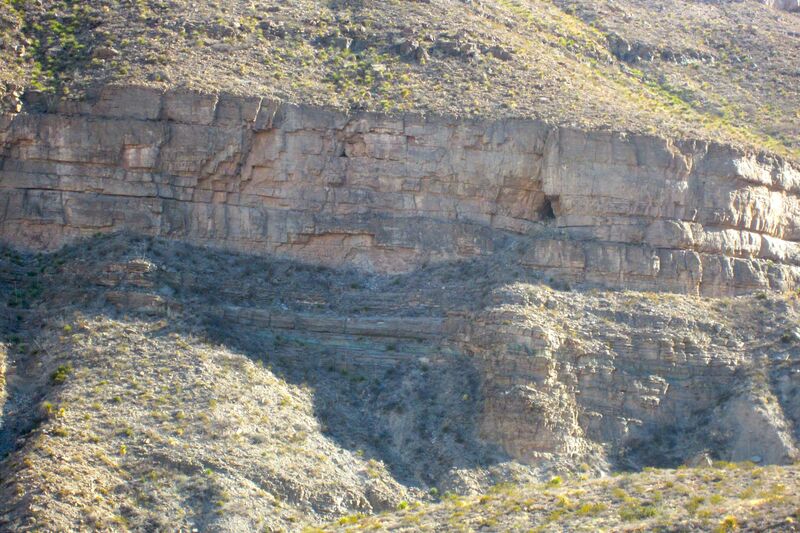 The photo on the right was taken from the second shelf and shows the “Eyebrow” across on the north face of the canyon. The stone ruin is out of sight in this photo, hidden by the grassy shelf in the foreground. 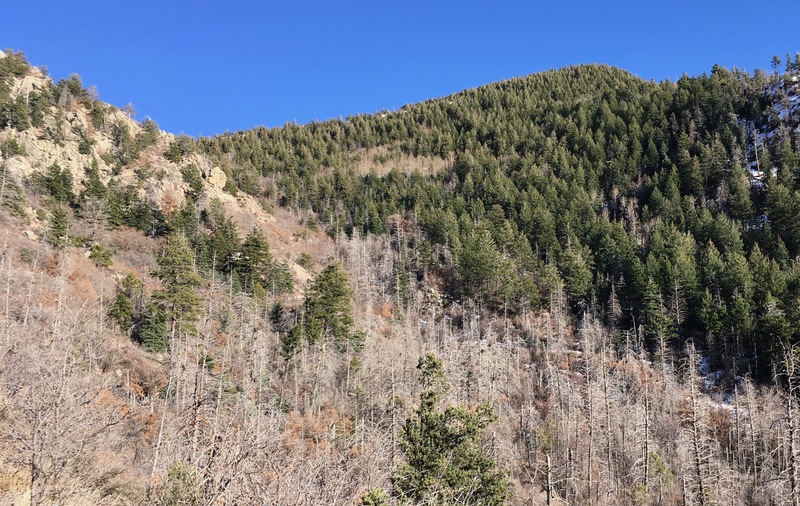 If you look just above the shelf, you can see a faint trail on distant wall leading up out of the canyon toward the deep gully that splits the cliff face on the right. The trail enters that gully where enormous labor has been expended to give the trail a stone staircase. The staircase ascends the first cliff band and then turns left onto the debris field that separates the two lowest-and-shortest cliff bands. It then traverses to the left, rising steeply in places, until it passes just above the large cliffs on the extreme left side of the image. There is considerable exposure in numerous places. The Eyebrow is a poor place to bring acrophobic friends. The views are spectacular. Shelf below the north canyon rim. Above the Eyebrow the trail ascends into a north-trending bowl, but eventually turns east and departs from the bowl onto a third shelf. This shelf is currently dry, but there are depressions suggesting that in wet times it may be home to several small tarns. Even dry it is a beautiful spot. Eventually the trail turns back north for a short series of switchbacks that takes you through evergreens to the true rim of the canyon. After a few hundred yards the trail ends at road 90B. Road 90B is rather long (2.5 miles), somewhat rough, flat, and offers only modest inspiration. It is truly forested, although the trees are all so small that I suspect that it was either heavily logged or burned in the not-too-distant past. It is popular with ATVs and high-clearance vehicle drivers, don’t expect it to be especially lonely. There was much evidence attesting to the popularity of both Bud and Coors products. As you get further along you can see the white man-made spire high above you at Sun Spot. After a short, gentle descent road 90B intersects with another gravel road (in much better shape) called West Side Road on maps but signed as “90”. Directly across road 90 is the Road Canyon trailhead. I’m pretty sure that this trail will take you to Sun Spot, although I didn’t get there myself. The trail goes through a pine forest. 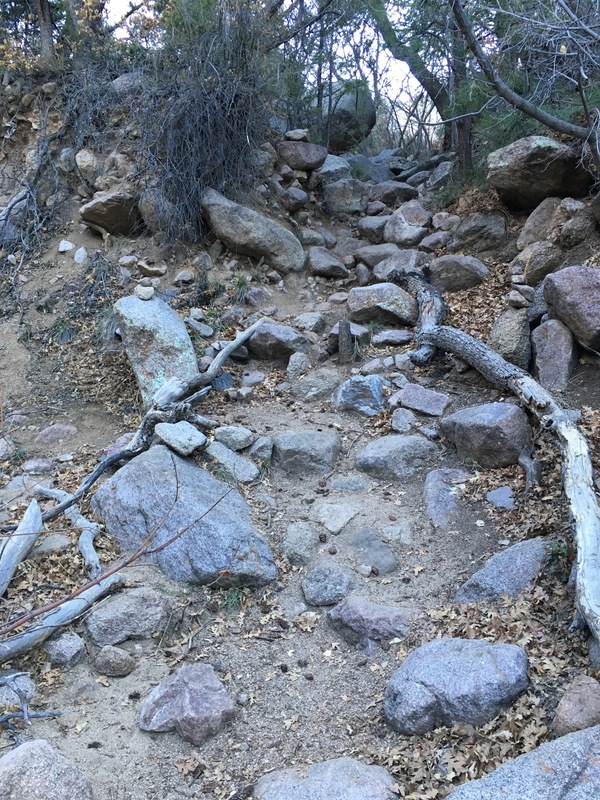 There was so much duff on the trail that I was initially uncertain of where the trail bed was, but the trail gets clearer as the terrain gets steeper. 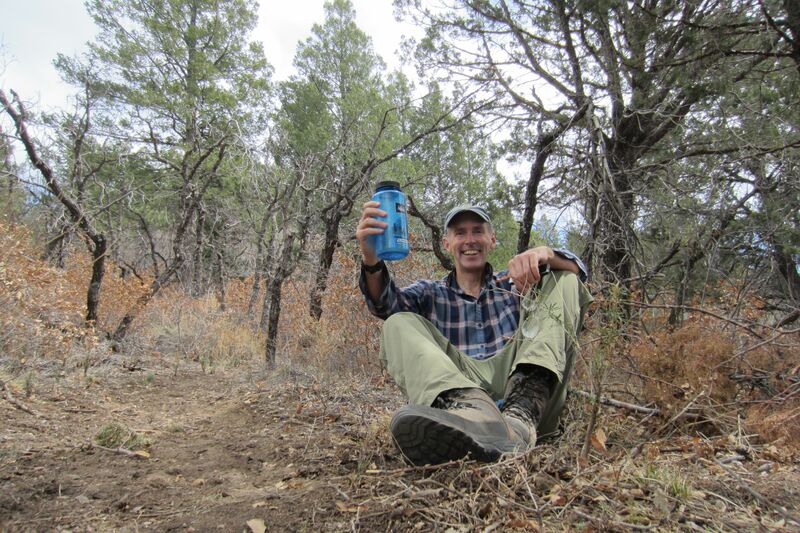 At my turnaround time, 2:00 pm, I was on a small knoll in a pine thicket. A fine, cool place to have a drink of water and eat a Payday bar. I’m guessing that there would be less than a mile and perhaps only a few hundred feet of gain to get to Sun Spot. It was a good idea to turn around since the sun was almost setting when I finally got back to the trailhead. Return by the same route back to the trailhead. 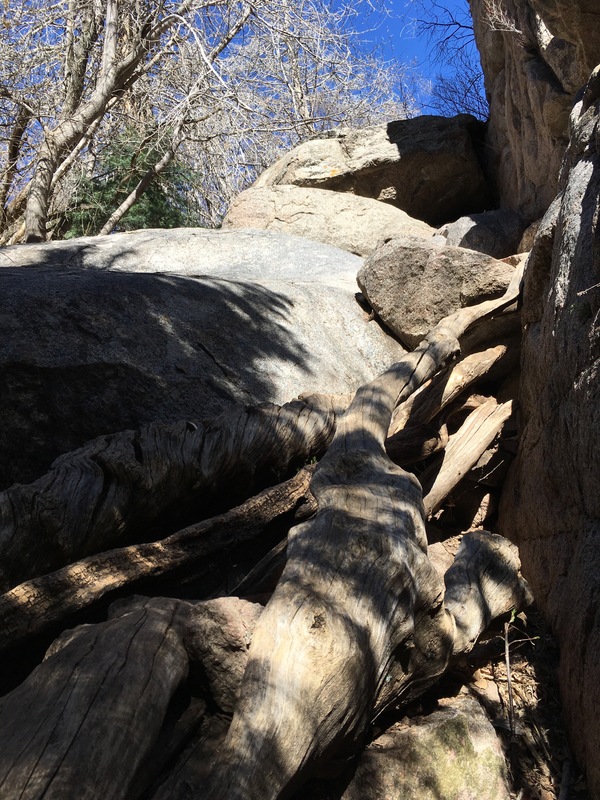 A previous post noted that in six months of New Mexico hiking I had not seen a rattlesnake. (Of course, much of that period was winter). That has now changed. 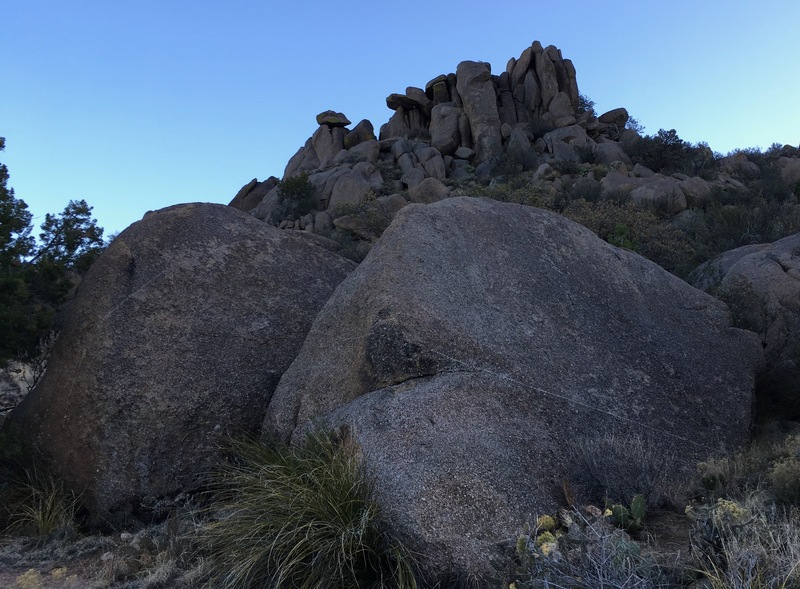 In the lower part of the upper bowl (just above the Eyebrow) a distinctive rattle sounded, from a snake resting in the shade of a yucca plant about a foot away from where I had just walked. The scales adjacent to the rattle were pretty dark, so it was probably a black tailed rattler. Apparently it was a friendly interaction, a reminder from one vertebrate to another that movement in the desert calls for a high degree of situational awareness. Taking the advice, I spent the rest of the descent scanning carefully for sinusoidal forms. 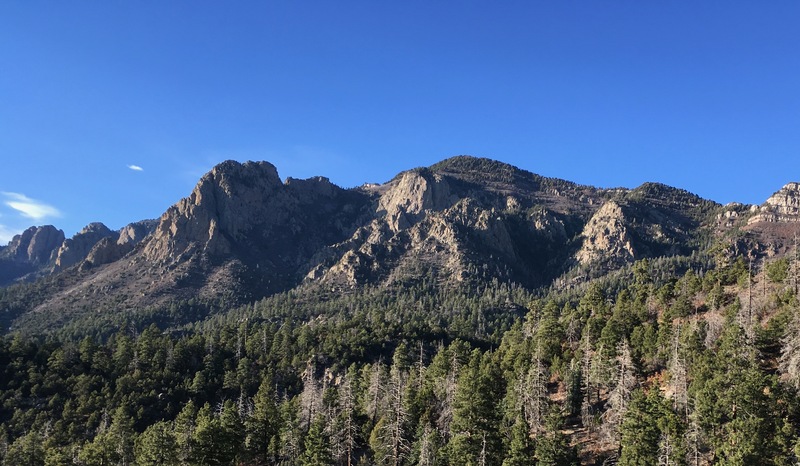 This is a great hike and a strenuous hike. 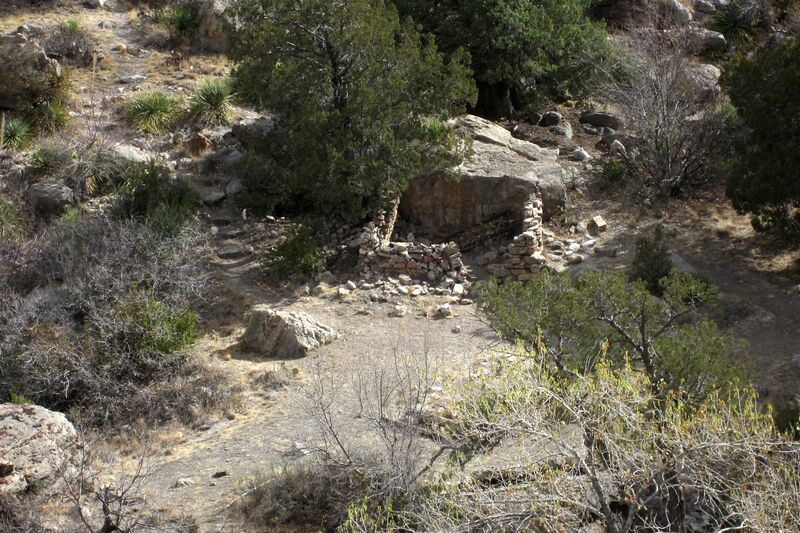 Next time I will make it an overnighter and camp on the shelf just down-canyon of the stone ruins (about 2.75 miles in). Watch for reptiles, keep an eye out for fossils in the limestone walls along the Eyebrow. 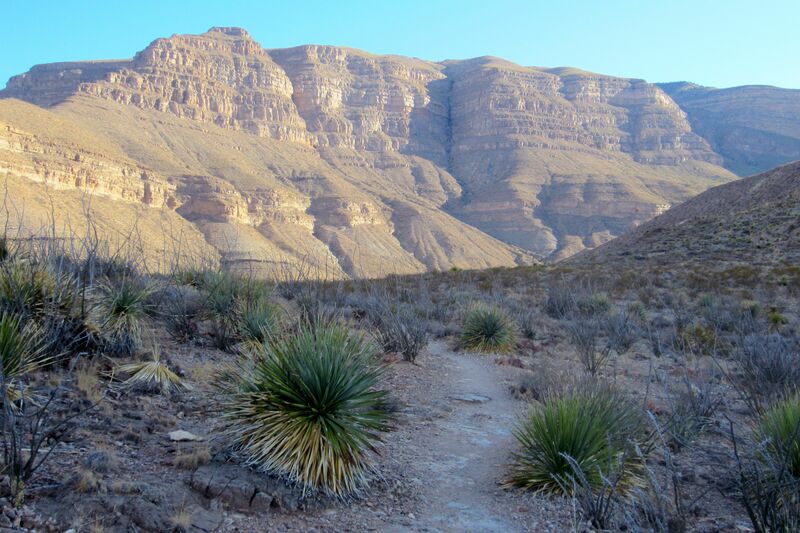 Everyone says that the guided nature hike along the canyon bottom near the Visitors Center is rewarding. Sunlight reflected off those sheer walls could be brutal on a mid-summers day.